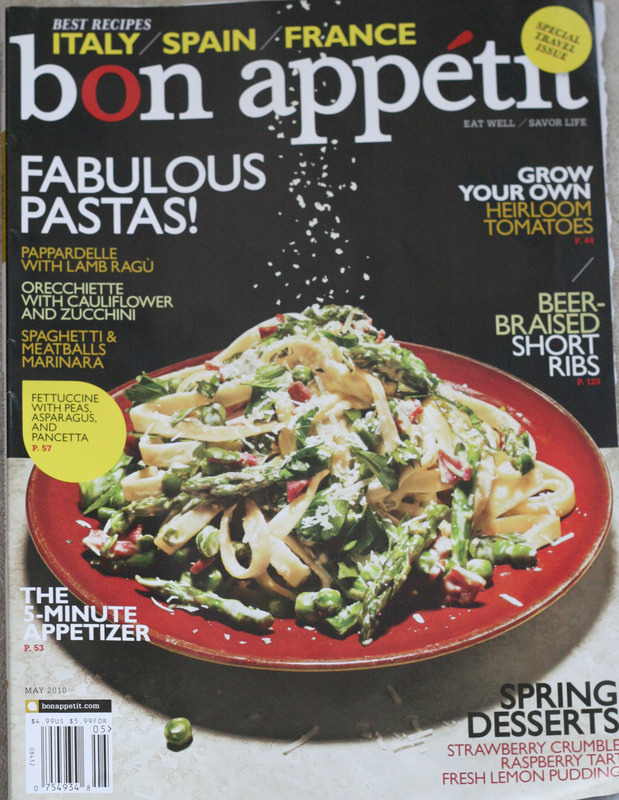 Bon Appetit -- This month's issue is labled the "travel issue" and contains a collection of recipes from Italy, Spain, France, Belgium, and the United Kingdom. Each collection is lengthy, filled with beautiful photos and art, as well as stories and recipes. There is also a feature devoted to carrots, which, apparently, are in season just now. 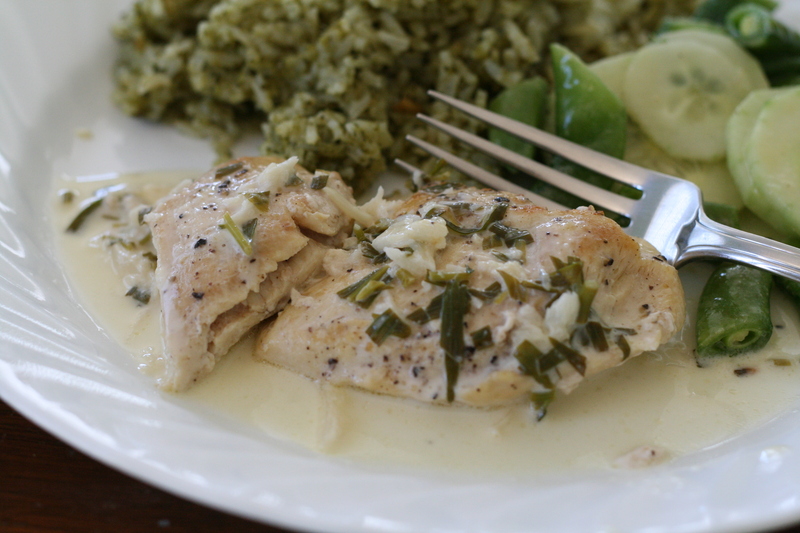 I tried the Chicken with Tarragon for a Sunday dinner and it came out very well. I was skeptical of taking time to roast garlic in a pan, but it was quick and easy and worked well. 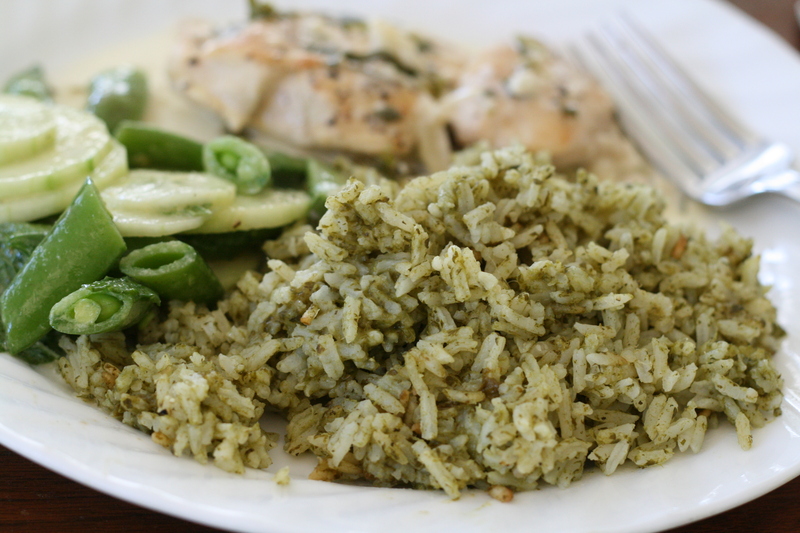 We paired the chicken with the green rice and cucumber salad (also included in this post) and together it was a scrumptious meal. We ended it with the Strawberry and Rhubarb Crumble from Monday's post. Heat small nonstick skillet over medium heat. Add garlic; cover and cook until browned in spots and tender when pierced, turning occasionally, 9 to 10 minutes. Transfer to work surface to cool. Meanwhile, sprinkle chicken with salt and pepper. Melt butter in large nonstick skillet over medium-high heat. Add chicken and cook until browned and cooked through, 3 to 4 minutes per side. Transfer chicken to plate (do not clean skillet). Peel garlic. Add garlic and wine to same skillet; cook until reduced by about half, mashing garlic finely with fork, about 1 minute. Add broth and tarragon; simmer until liquid is reduced by about half, 1 to 2 minutes. Add cream and simmer to sauce consistency, about 1 minute. Return chicken to skillet with any accumulated juices. Simmer to heat through, turning occasionally, 1 to 2 minutes. Transfer chicken to plate; spoon sauce over. 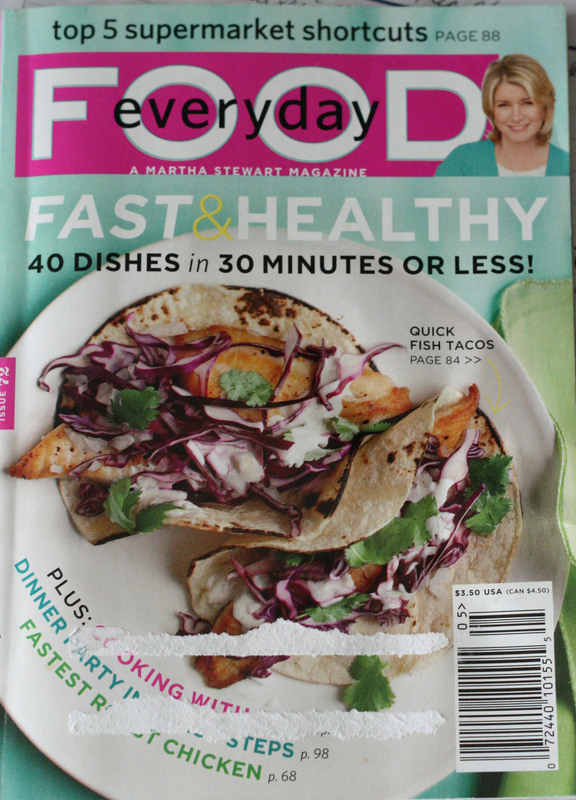 Everyday Food -- of interest in this issue is a feature on raspberries (apparently these are in season too? Perhaps at the grocery store, certainly not in my backyard) with some amazing-looking recipes included. Another feature tells what to do with jarred, roasted peppers. The Breakfast for Dinner feature dishes up some very tempting meals that look easy and delicious. As always, there are a number of great, everyday meals, side dishes and desserts included as well. I made the Green Rice and the Cucumber and Snap Pea Salad. Both were easy to make and turned out well. The salad was so fresh and delightful that we'll be having it again soon. Honestly, I couldn't stop eating it. 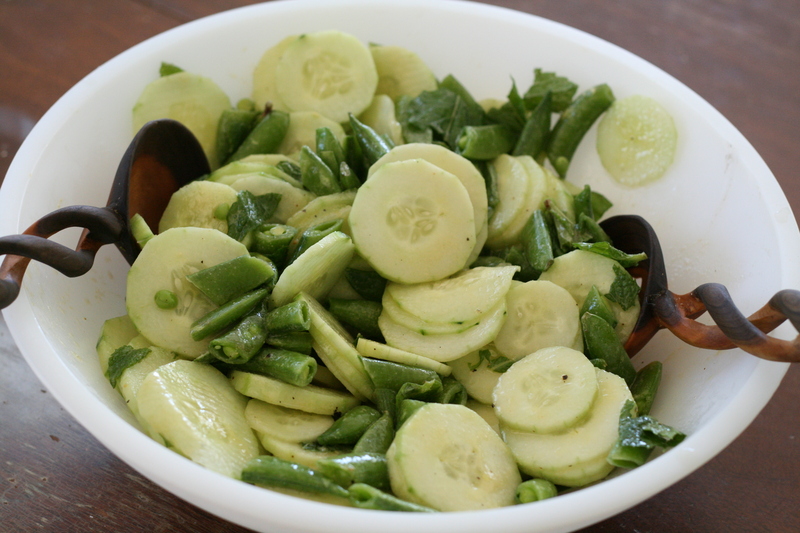 A perfect salad for spring! In a blender, combine cilantro, parsley, onion, garlic, water, salt and pepper. Blend until smooth. In a medium saucepan, heat oil over medium-high heat. Add rice and stir to coat. Add herb mixture and bring to a boil. Reduce to a simmer, cover and cook until water is absorbed, about 15 minutes. Remove pan from heat and let sit, covered, 5 minutes. Add lime juice and fluff with a fork. Serve rice with lime wedges if desired. In a large bowl, whisk together olive oil, vinegar, and mustard. Season with salt and pepper. Add cucumbers and peas. Toss to combine. Stir in mint just before serving. 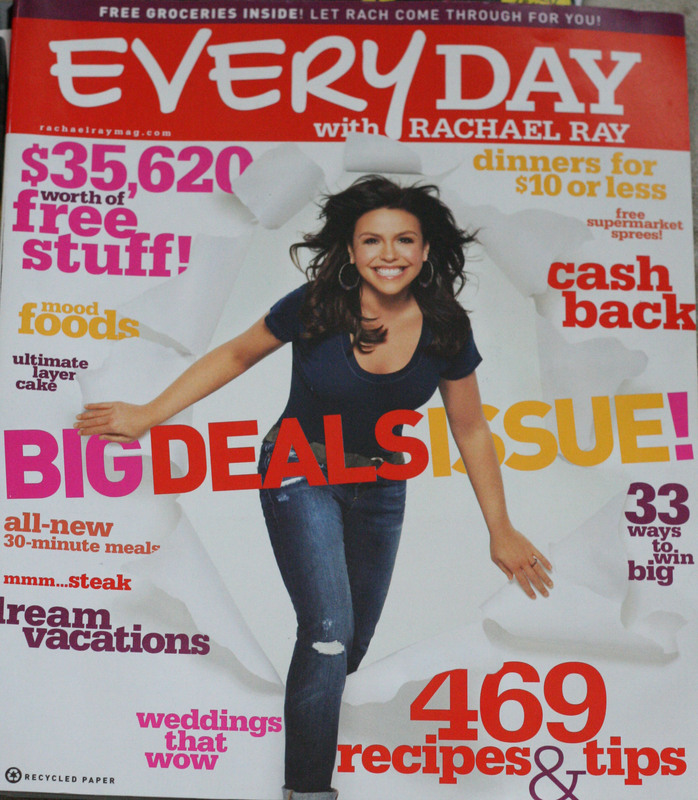 Everyday with Rachael Ray -- Once again I am keenly aware that many magazines don't follow seasonal eating very closely. While this magazine does include a number of seasonal-appropriate recipes (like Asparagus, Ham and Egg Pasta, and Rhubarb Fool), I question the appeal of recipes such as Potato-Leek soup, Chili, and Spaghetti Squash for this spring season. I felt this issue belonged more in fall. However, there is a large section devoted to parties and weddings, which was fun to look through and might be beneficial if you are looking for ideas along those lines. I tried the Gemelli with Fennel and Hot Sausage and it was an easy and delicious weeknight meal that is worth repeating. Preheat oven to 425F. 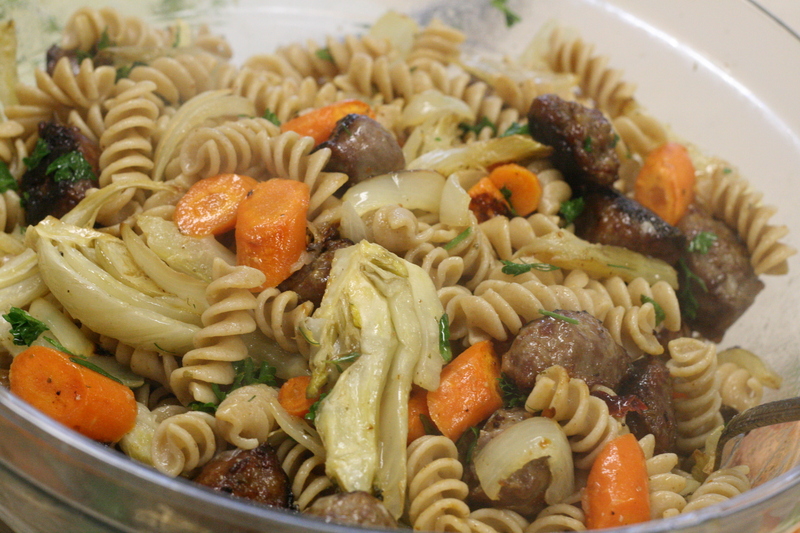 On a baking sheet, toss the sausage, fennel, onion and carrots with the olive oil; season with salt and pepper. Bake until the vegetables are tender, about 30 minutes. Add the sausage -vegetable mixture to the pasta. Add the reserved pasta cooking water to the baking sheet, scraping up any browned bits; transfer to the pasta mixture. Toss in the parsley; season with salt and pepper. NOTE: My kids liked this with grated cheese sprinkled on top. 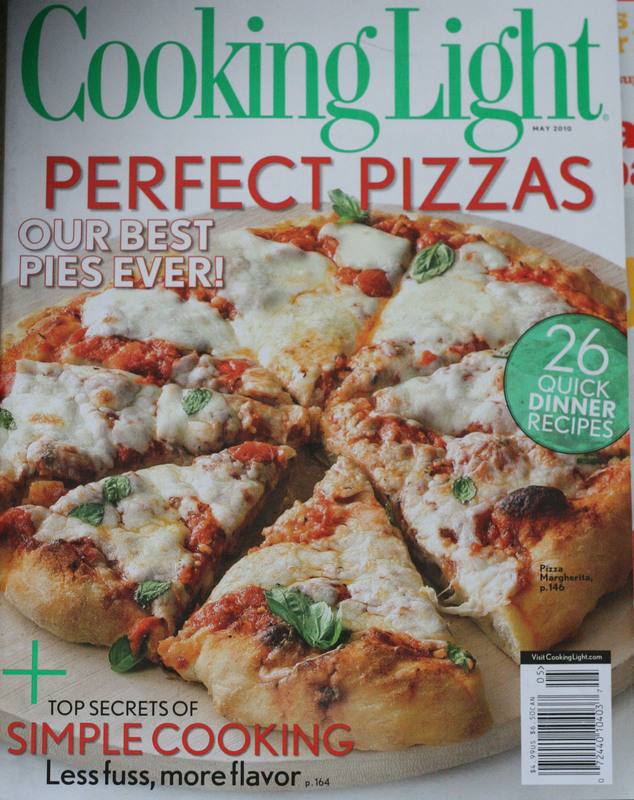 Cooking Light -- While I didn't get any recipes made from Cooking Light this month, I did bookmark a number of recipes that looked appealing. This issue includes an article on sandwiches, healthy eating while in the DC area, and a great round-up of seasonal recipes in the Dinner Tonight feature. If you are into homemade ice-cream, you may want to check out their cooking class article on light ice-cream. There is also an article on smoothies. The longest feature is devoted to pizza, with recipe after recipe of delicious and ingenious combinations for this favorite American food. Other articles include: Haitian-American food, simple spring recipes, spring risottos, and budget cooking. If you want a magazine that says SPRING!, this is probably the one for you.